I could understand what he was saying, but it didn’t come naturally to me. I had to be reminded to look for it. To see the stuff that’s there but not there. 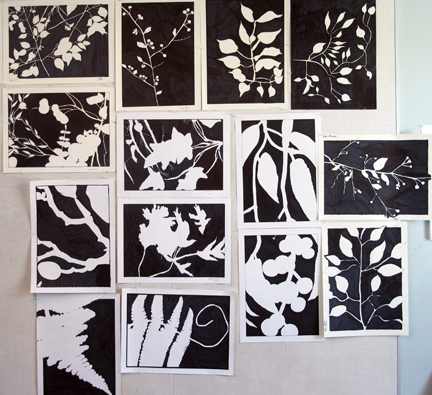 We are looking at the space between and around the subject – we are looking at negative space. After I have given the directions I come around and remind each student what we are doing. Some students find themselves frustrated and others take to the focus easily. That’s just the way it plays out. And though a few insist that they don’t exactly have it down, they all come through with beautiful completed works. Kayla (above) a Drawing 1 student, completed both in class and home work and still worked on an extra drawing. She went outside and after seeing what she was doing I handed her a box of pastels with not much direction on how to use them. I just thought she should have fun and experiment – she did. Below are Drawing 2 students. 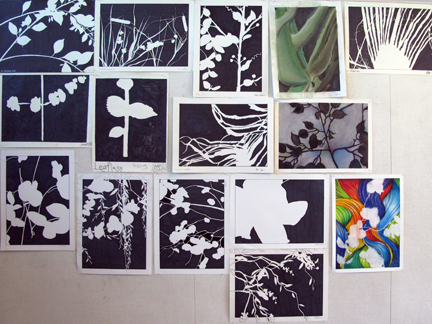 They experiment with different media, though still focus on negative space. Ma is a Japanese word which can be roughly translated as gap, space, pause or the space between two structural parts. Into the last week of school. Spring semester flew. Students complete the first charcoal study, a lesson on value. Overall they do a fine job. They work off of color fabrics, and learn to distinguish lightness and darkness in a design. I let the assignment continue one day longer than scheduled, because the majority want another day. Consequently there’s no time for critique. We’ll have a final class critique next week and it will include discussion on these works along with the final assignment. The last lesson of the semester is a still life using a light source…continued looking at value but also working more intently with creating illusion of depth. Here are a few works, in process and in completion. Note the surface of the work. Charcoal allows emphasizing lights and darks and creation of rich surface. Students are experiencing new freedom and expression. Oh…I couldn’t help using that quote. The political climate is absurd these days. Are we losing our minds? Enough of that. …back to drawing, and the classroom, where we’re developing our minds. We play with edges, but not such crazy ones. It’s a new semester, a new group of students, first assignment, and a new batch of contour studies. Today we hold our first class critique. For the assignment, students were asked to look closely at the subject matter and draw only what they see, using inner and outer contour line. It’s a challenge. Critique goes the full 2.5 hours. Everyone has a chance to speak and share their work. Some students are clearly more at ease with the critiquing process than others. Understandable. A few are consistently generous with their thoughtful commentary. Experience. The classroom is really a microcosm of the macrocosm. Learning to look closely is a skill worth developing. Learning to see clearly is a valuable asset. Here are a few of the classes favorites. An eloquent beginning to a new semester. Everyone has a bit more experience than they came in with, and hopefully everyone has a bit more confidence as well. Now…to getting these spot lights fixed… so we can see the whole picture more clearly. The semester is unusual in that I only have 4 female students in the class. What’s more unusual, none of them are present at the start of critique, this week. Eventually one of the women does show up. Better late than never. In the meantime, we have fun with the class photo. We create a line up. The only thing these men are guilty of, is drawing with charcoal and pastel. Critique is good. Everyone appreciates the finished drawings….they’re strong compositions. We discuss the challenge of the material, that everyone experiences. We discuss the variety of the values, and the surface of the drawing. We talk about how realistic something appears in terms of the cloth, and we talk about space, layers, and edges. I’ve discussed this assignment before (11/30.2009). We’re in the midst of working with value. It’s the first real charcoal drawing many of the Drawing 1 students have ever worked on (keep this in mind when you see their work below). One advanced student works in color, with pastels. They complete a value scale right before starting the still life. They know by the time the value scale is finished , elbow grease will be required, from this point forward. Also necessary and in development, is another form of patience. It seems they just learned to control the marker, and now they have to let that go…because charcoal…has it’s own very unique challenges, in terms of trying to control it. It goes everywhere. I always notice the class, in general, becomes more quiet with the charcoal studies. In all honesty, I find it very hard to be in the classroom teaching, on some days. I want to be drawing too…that’s what watching the students learn this particular medium especially, does to me. The end of semester is quickly approaching. One more drawing, and one more critique. Drawing class…critique day. Assignment was challenging. I knew it would be, they knew it would be. We jumped in any way. And then they really realized the challenge. No turning back. All about the looking. To look at and draw a complex structure is not easy. To look at and decipher texture requires attention. Students learn to stay focused in a much more intense manner than previously. I will say…this group has appeared to be very focused, in general. So much so that I have decided to share photos of the process instead of the end result. You can see how much they’re looking and how much they’re drawing. For the record…end results are impressive. I know it and they know it. Class ended on a high note.